This week, Yahoo continued with its prolific acquisition strategy with a one-two punch picking up companies working on video — a sign that, while some of its acquisitions have been basic talent grabs, at least a few of them have a very specific focus to them, concentrating on fixing its long-neglected video business. The move taps not just into how Yahoo hopes to build up its audience of users who spend more time with Yahoo, but also subsequently tap into premium advertising served alongside it. First the basics. On Friday, Yahoo announced its purchase of EvntLive, a virtual venue and concert hall for live and on-demand music. EnvtLive debuted in February with plans to re-define the way people engage with music online by creating a scalable platform to host live, streaming concerts — from sold-out arenas to intimate clubs. Just days before, it had made another video buy, acqui-hiring the team behind DreamWorks-incubated mobile video company, Ptch (apparently in a raw deal for early employees). The app, among other things, aimed to make it easy people to video mashups by providing tools that allow users to remix their existing content by adding music, effects and to share with friends. 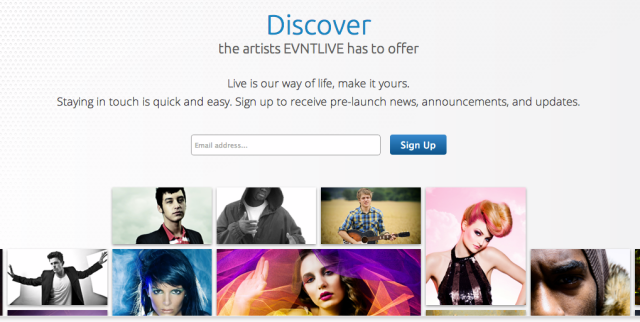 EvntLive’s goal was to support its live, streaming concert venue with a curated, searchable library of shows for fans that may have missed the live concert, which would then be supported by social media integration, premium content (like behind-the-scenes video), a database of information about artists and an eCommerce marketplace where fans could purchase stuff from their favorite bands. 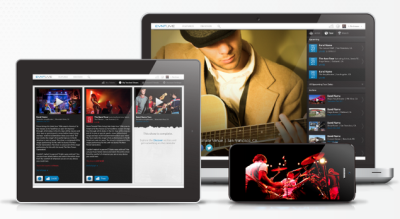 While live, online music has attracted many startups over the years, it has yet to produce a definitive platform, partly due to the many obstacles inherent to the music industry, its resistance to digital technologies, and the slow, painful sea change that has fundamentally reshaped the music business over the last five years. Nonetheless, EvntLive saw an opportunity to be take advantage of the new distribution, marketing, recording and manufacturing models making their way into the music world, and be the first to combine streaming video, live music, social networking and eCommerce in one music platform. The startup’s potential appeal was also boosted by some veteran leadership and talent from both the music and tech industries, starting with people like Judy Estrin. Estrin, who served as EvntLive’s Executive Director, began her career working with Vint Cerf’s research group at Stanford University — the same one that played a central role in the development of the Internet. She has founded seven technology companies, served as the CTO of Cisco Systems and held board positions at FedEx for 20 years, Sun Microsystems for eight years, and currently sits on the board of The Walt Disney Company (a position she’s held since 1998). Troy Carter, who represents artists like Lady Gaga and John Legend, served as both an advisor and investor, and EnvtLive had raised $2.3 million in capital from a long list of investors. Those included people like “Father of the Internet” and Google exec, Vint Cerf, Mayfield Fund partner and Glooko Chairman, Yogen Dalal, former Intel exec Dave House, Tapjoy President and CEO Steve Wadsworth, among others. Neither Yahoo nor EvntLive are revealing the terms of the deal, but EvntLive has revealed that its platform will be shut down. Compared to other video-centric acquisitions Yahoo has made, like Ptch and Qwiki, which had both been around for quite some time, EvntLive launched less than a year ago. So, in that sense, the exit-and-shutter result may leave some of its early supporters with a bad taste in their mouth. It could be that EvntLive found more friction in the music industry than it had expected or that perhaps adoption didn’t take off as quickly as it had hoped. But when we caught up with Judy Estrin today, she told us that, while it was a difficult decision for the team to make, the opportunity to be part of a bigger company and have access to the resources that come with it, won out. As a result of the acquisition, Yahoo will now be able to use the startup’s technology throughout its digital media, video and music products, which, in turn, gives EvntLive access to a much larger network and audience than it might have reached on its own. Plus, though the team started out by focusing on music, the idea was always for EvntLive to become a platform for a wide variety of events, she said. With Yahoo, EvntLive will likely have that opportunity. However, it is worth noting that neither Estrin, nor co-founders David Carrico and Alex and Jonathan Beckman will be joining Yahoo. While it’s an early end for EvntLive, things are just beginning for Yahoo. EvntLive, following recent acquisitions like Ptch and Qwiki, is further evidence that Yahoo is getting serious about investing in and fixing its video technology. In a world where video and digital entertainment are thoroughly dominated by Netflix and Google-YouTube (half of the Internet’s traffic, in fact), it’s easy to forget that companies like Yahoo used to contend in the space. But over the years, the company’s video products and technology have been left in the dust by the Hulus and Netflixes of the world. That was put into stark relief when Yahoo announced its acquisition of Tumblr this summer. The event, which was streamed live via its streaming video tech, “Screen,” was unwatchable. The video cut out and was hicuppy throughout. As a result, I pleaded with the company to reserve some of its seemingly endless M&A budget to buy better video technology. Not saying that Yahoo heard those pleas, but this summer, for the first time, Marissa Mayer began publicly talking up the company’s plans in video. Building a better video platform has become a top priority, she said at the time, adding that video would be a “primary area of investment over the next year.” What’s more, Yahoo made the unprecedented move to broadcast its second quarter earnings call live this year. And just look at Yahoo Stream and Yahoo Music’s homepages. They’ve improved over a year ago, but they still need a lot of work. Why would you visit those instead of YouTube, Hulu or even, gasp, Aol for video? [Disclosure: TechCrunch is owned by Aol, but that doesn’t mean we don’t still think it’s a joke a lot of the time.] Or Spotify for music? On the video front, Adding SNL was a big move by Yahoo and, in the end, if you have the content, licenses and contracts, then people will come anyway while you fix the tech and the design. But, really, isn’t the question whether Yahoo should even be trying to compete with Netflix, Hulu and Amazon for the rights to stuff like SNL’s archives in the first place? Arguably, that’s a more significant question than the degree to which it’s behind Tech Company X or Y in video, etc. Although, clearly, having added Katie Couric as an anchor, Yahoo is indeed serious — both about fixing video and competing with, well, someone. Aol, most likely. If Yahoo is looking to Tumblr to have a connection to younger audiences, Couric is something different. Because, for most people under 50, adding Katie Couric as an anchor won’t make a difference to their viewing habits. Services like EvntLive and Ptch sit apart from content grabs: their technology and services can be used across all of them. While we know that EvntLive will be joining Yahoo’s video team and that its homepage now includes links to Yahoo Screen and Yahoo Music, both Yahoo and its new aqui-hires have remained mum about how they plan to improve and modernize these products. (Beyond just making sure that streaming video means streaming video.) It’s very likely that this plan is still evolving and may not even be clear on that as of yet. But Estrin has told us in the past that the team had a lot of pride in the engineering team and technology infrastructure it had built behind its virtual concert hall, and there’s no doubt that Yahoo needs it. It still has a long way to go in both video and music. Although hope and confidence are returning for investors and analysts, looking at the gap between Yahoo and other tech leaders in music, video (and a number of other arenas) it’s hard not to wince. It’s going to need all the EvntLives it can get.